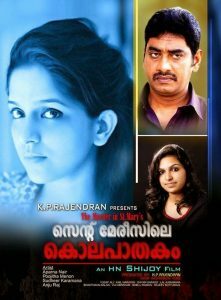 The crime thriller ‘St Marysile Kolapathakam’ is getting ready to be released in March. Sudheer Karamana and Sreejith Vijay do the lead roles. ‘St Marysile Kolapathakam’ is written and directed by debutant H N Shejoy. The movie is produced by K P Rajendran under the banner of Krishnanjali Films. ‘St Marysile Kolapathakam’ is a suspense thriller which revolves around a murder that takes place at St Mary’s Working Women’s Hotel. Aparna Nair and Anju Raj do the female leads. Rohit Menon, Indrans, Yousef Ali, Poojitha Menon, Leena Nair, and Veena Sivaprasad do the other important roles. Allu Arjun dubbing for Badrinath!